Can I use wind energy to power my home? More and more people across the country are asking this question as people look for more affordable and reliable sources of electricity. 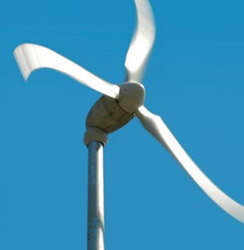 Small wind electric systems can make a significant contribution to our nation's energy needs. Although wind turbines large enough to provide a significant portion of the electricity needed by the average U.S. home generally require one acre of property or more, approximately 21 million U.S. homes are built on one-acre and larger sites, and 24% of the U.S. population lives in rural areas. One of the most common issues with installing a wind energy system are zoning ordinances. Restrictions on height in residentially zoned areas generally have a limit of 35 feet, though variances can be obtained. Research possible restrictions by contacting the local building inspector, board of supervisors, planning board and/or homeowners association. The should be able to tell you if you will need to obtain a building permit and provide you with a list of other requirements. In addition to zoning issues, you may find that your neighbors object to a wind turbine blocking their view, or be concerned about noise. Most zoning and aesthetic issues can easily be addressed by supplying objective data. For example, the ambient noise level of most modern residential wind turbines is around 52 to 55 decibels, making it no noisier than the average refrigerator. The typical home will use approximately 10,000 kilowatt-hours (kWh) of electricity per year (about 830 kWh per month). 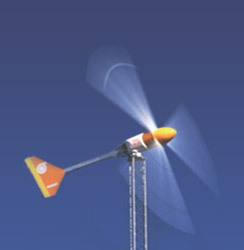 Depending on the average wind speed in the area, a wind turbine rated in the range of 5 to 15 kW would be required to make a significant contribution to this demand. A 1.5- kW wind turbine will meet the needs of a home requiring 300 kWh per month in a location with a 14- mile-per-hour (6.26-meters-per-second) annual average wind speed. 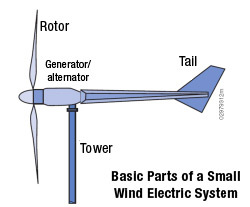 Home wind energy systems generally comprise a rotor, a generator or alternator mounted on a frame, a tail (usually), a tower, wiring, and the "balance of system" components: controllers, inverters, and/or batteries. Through the spinning blades, the rotor captures the kinetic energy of the wind and converts it into rotary motion to drive the generator.